If you sleep beneath an exposed beam, suspend a faceted crystal from it. This will disperse oppressive energy from your love life. Start a conversation with someone to whom you could talk all night. You might find that there are expressions beyond the verbal. Do you speak body language? General Meaning: Nothing survives forever, not even rocks, not even the most rigid of structures. The erosion of that which has been solid is not necessarily bad: it can mean that something new is being created. The image is of ice floes, hardened in winter, dispersing in the warmth of spring; when the ice melts, a mighty river emerges. Rigidity in the hearts of men and women tends to breed a separateness that can only be thawed by a greater force: typically, some strong spiritual stirring. The thawing of cold hearts always improves conditions. The first thing to dissolve is any internal rigidity that separates you from others. Try to work more closely with your mates, concentrating on common activities which evidence your integrity and native goodwill. Sudden, strong action in support of a greater good can lift the spirit, and lead toward new possibilities in many areas. Spiritual impulses — including a strong sense of justice — should be honored, and acted upon. They can provide the initial impulse to important and constructive change. And if you should have any lingering business or partnerships which are inactive or not working, you might consider dissolving these as well. Posted on June 14, 2011 by ladyoftheabyssPosted in Daily PostsTagged General officer, Health, Hexagram, Humility, I Ching, Learning, Recreation, Religion and Spirituality. You’re ambitious today, and this is good for business. You may engage in work planning, and be looked upon as a source of authority. On the personal front, healing in relationships is possible. You’re a person of influence today, and you may be the recipient of promising news. A lack of care for detail is something of which to be aware. Posted on June 14, 2011 by ladyoftheabyssPosted in Daily PostsTagged Alternative, Complementary and Alternative, Energy Healing, Health, Practitioners, Social responsibility, Tarot, United States. General Meaning: In the most practical terms, what has traditionally been called the Emperor card represents the highest leadership, a head of state or the most exemplary and powerful person in the realm. This archetypal ruler is responsible for the positive working out of affairs of a society or community, which are directly proportional to his well being and happiness. The more enlightenment and cosmic perspective this energy brings, the better life is for all. The Emperor archetype masters the world of matter and physical manifestation. When you apply this card to your situation, acknowledge your potentials for mastery. Reinforce a sense of sovereignty within yourself, despite any self-limiting beliefs, habits or appearances to the contrary. 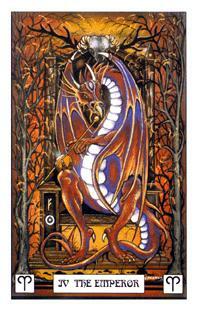 Posted on June 14, 2011 by ladyoftheabyssPosted in Daily PostsTagged Archetype, Cartomancy, Divination, General officer, Head of state, Proportionality (mathematics), Religion and Spirituality, Tarot. Although the inspirational Sagittarius Moon lifts our spirits far above the noise of the day, energetic Mars’ anxious aspect with constrictive Saturn limits our spontaneity and intensifies our frustration. Charming Venus forms an uncomfortable quincunx to relentless Pluto, tempting us to increase our efforts to get what we want. Unfortunately, satisfaction remains elusive and pleasure will likely have to wait until after tomorrow’s eclipse. You may think that you’re going to cruise through the day, but that’s because you aren’t expecting the obstacles that might appear in your path today. Your intended playtime quickly shrinks because meeting your obligations takes longer than you expected. Unfortunately, having a great idea doesn’t necessarily mean that you have a workable plan. You need to initiate action to get things going now or you won’t be able to take some time off for fun later. You have responsibilities that take precedence over everything else today, so don’t accept a new job unless you believe it to be very important. If you promise to do something simply because of social or family pressure, you’ll probably fail anyhow. However, if your heart is fully engaged, then things should fall into place, even if it’s a struggle at the beginning. Don’t even try to assess your progress for several weeks; concentrate on the long-term picture, instead. Your focus is on relationships now that the Moon is visiting your 7th House of Partners. Although the farseeing Sagittarius Moon encourages you to set lofty goals, you might encounter someone who embodies the Sagittarius spirit of big thinking. But don’t get overly excited or you could inflate one another’s expectations so much that your dreams become impossible to reach. Sharing your enthusiasm is a great place to start as long as you also have a practical plan in mind. Although the Moon’s visit to your 6th House of Employment doubles your workload, you may believe that you can finish everything in a very short period of time. Unfortunately, you are being very impractical with your optimistic assessment. Luckily, your amazing friends come to the rescue by offering to help. But leaning on them too much isn’t a good idea right now because they may not be as reliable as you wish. Nevertheless, some assistance is better than none at all. Your friends may be moving too quickly for you today. It’s not that you are unable to keep up with them; it’s just that you are bored of engaging in clever conversations without any lasting meaning. Unfortunately, going along with the group can backfire when your level of frustration rises, prompting you to express exactly what you feel. Balancing your abrupt words with a little sensitivity is wise since you might not realize the power of your message. Your high expectations are not a guarantee that anyone will deliver exactly what you want. It may even be your boss or someone in power that lets you down today. Although you are able to recognize the dynamics, it’s still challenging for you to let go of your preferences. Protect yourself from being disappointed by remembering that other people’s actions are beyond your control. However, you can always change your response. A current relationship could become awkward today. It may be apparent that you each want something different and although you both talk about compromise, neither of you are in the mood to negotiate. Unfortunately, it’s tough to sustain a heart connection while you are disagreeing about basic values. Don’t waste your energy trying to resolve the current tension; you’ll only feel worse if you attempt to force a resolution now. Fortunately, a conflict will likely dissipate on its own in a few days. You might be frustrated by someone’s behavior today. A loving friend is only trying to help, but chances are that everyone else’s solutions will be so far off target that assistance from others is more troublesome now than productive. You may be left feeling that no one truly understands what you need. Don’t try to justify your beliefs; just retreat enough to reclaim your center of gravity and then move on. The Moon’s current visit to your sign might be overwhelming if you are flooded with emotional messages that contradict each other. You wish you could set aside logic, but it’s smart to resist the temptation to react to every single whim. Instead of being irrational, observe your changing moods until they reveal a larger story. Being patient with your process allows you to honor your feelings while also acting in a responsible manner. The pursuit of love may be unsatisfying today if an unattainable goal leads you around like a carrot on a stick. You could waste precious time chasing an unreachable dream if you don’t pay attention to the bigger picture. Fortunately, you can redirect your focus toward more practical goals by consciously changing your priorities. Once you have decided on a sensible destination, your hard work will pave the road to success. You want to socialize today as the Moon moves through your 11th House of Networking, but previous commitments may require so much energy that you don’t have enough time. Your quiet frustration could turn to anger, but there doesn’t seem to be an available outlet for your emotions now. In spite of your desire to be with others, a temporary retreat could be what’s needed to shift the current dynamics. You might not have the best plan, so be as flexible as possible and don’t try to control everything. You Fish may feel as if you have been left high and dry today. Professional demands require logical long-term planning, yet your heart’s desires could get left out of the equation. There is a significant amount of activity in your life now, and your personal needs might have to be put on hold so you can manage the complexity of the present moment. This state of emotional suppression is temporary; give it a few days to see where this strategy leads before trying a new approach. Posted on June 14, 2011 by ladyoftheabyssPosted in Daily PostsTagged Eastern Time Zone, Energy, Mars, Moon, Pluto, Saturn, Venus, Wine tasting descriptors. Your feet will continue to trouble you today, although you won’t be quite able to put your finger on what’s wrong. You haven’t been that flexible in years. Once you’re that far behind, there’s really no way to get caught up. You might as well do something fun instead. You can tell them I told you it was ok.
You will go on a potato binge today. Baked, fried, scalloped, stuffed, mashed, whipped, and hash-browned. Just stay away from the tater tots, for your own good. Today you will realize that it seems quite impossible to make any sense out of life, especially when you consider what life must be like in Nebraska. Good day to make a face like a rodent, and hold your paws up in front of your chest. When someone asks what you are doing, chitter at them and scurry away. Today you will get very dirty. Actually, though, it will be rather fun. Good day for political intrigue and underhanded sneakiness. Try to wear something appropriate to the occasion. At the same moment you read this, someone will be thinking about you and smiling. In a moment, they’ll be laughing outright. You will be misidentified, on national TV, as a renowned ichthyologist. Several people will call you, long distance, to ask about the mating habits of Tilapia. If you’re not already a vegetarian, you will be. Someone with the initial “E.” will make sure of that. Ed? Ernest? Dunno. Someone like that. E. Coli, is what I see. Odd name, huh? Sounds Italian. The currency crisis in Russia will continue to trouble you. The next time you have a dream in which you are told by your old Uncle Max to invest all your money in a canned borsht factory in Leningrad, you might stop to consider the alternatives. I hear that mutual funds can be nice, for example. Posted on June 14, 2011 by ladyoftheabyssPosted in Daily PostsTagged Aries, Capricorn, LIBRA, Nebraska, Russia, Taurus, Uncle Max, Virgo. After a suitable meditation time with the tattwas, when you feel you are ready, stand and face the north. Visualize the northern gate with the tattwa of earth carved upon it. The entry can be a golden gateway or a monolithic stone structure, or even a simple wooden gate. Stare into the tattwa until its aura begins to become visible, then shift your focus to the gateway. You should begin to see the fog lift, and the portal will be clear. It may look like a swirling vortex at first, but it will eventually take on a form that represents that element. Turn east and repeat the process. Continue with all four of the elements if you wish, or you may choose to open only one gateway at a time. If you wish, you may protect yourself with a personal bubble and enter into the realm of the elements. Be sure to ask that the gate remain open. Explore and commune as long as you like. When you are done, make sure to close each gateway by allowing your vision to blur as you look at it. The vortex should become active again, and the fog will settle. Posted on June 14, 2011 by ladyoftheabyssPosted in Meditation, The ElementsTagged Brooklyn Bridge, Gateway Arch, Golden Gate Bridge, Mount Rushmore, National Park Service, Statue of Liberty, United States Park Police, Washington Monument. Create a simple altar with an orange cloth and a red candle. Use an amber- or wood-scented incense. Take several deep, cleansing breaths. Get comfortable. Focus on your breathing and close your eyes. Visualize the gateway to the elemental realm of fire. Make the gate as strong and elaborate as you wish. How does it open? Take several slow, deep breaths. See the gate open and walk through it. Everything is dark. Before you is a pathway illuminated with candles on each side. It is a broad, safe pathway. Begin to walk down it. Slowly stars become visible in the dark sky. Take a moment to appreciate the twinkling lights. Focus on the candle flames and note that no two candles are exactly alike. They dance in various colors on the tips of the candles. You feel warm, safe and happy. Focus on your breath. Further on down the path you see your elemental guide for the realm of fire. Approach him slowly and greet him warmly. Listen to what he has to say. When you have heard all you wish, thank him and then turn to go back up the path. As your approach the gateway you notice it is still open. Walk through it. Take several slow deep breaths and then open your eyes. Write down all you learned in your journal. Close your personal circle. Posted on June 14, 2011 by ladyoftheabyssPosted in Meditation, The ElementsTagged Accessories, Business and Economy, Candle, Handcrafted, Home and Garden, Moon, Scented, Shopping. Create a simple altar with a bowl of water and floating blue candles. Use a rain-scented incense. You may keep a chalice filled with wine or a favorite herbal tea on the altar. Take several deep, cleansing breaths. Cast your personal circle. Close your eyes. Visualize the gateway to the elemental realm of water. What does it look like? How does it open? Focus on your breath. Keep your breathing deep, slow and steady. See the gate open, and walk through it. Amazingly, you find yourself walking across the bottom of the sea, yet you can still breathe easily, encased in your own personal bubble. The sand is firm under your feet. Around you are bright coral shells, starfish, sea horses, and dolphins. Schools of brightly colored fish swim by. Walk slowly toward the figure you see in the distance. Focus on your breath. You are calm, relaxed and happy. Greet your elemental guide for the realm of water, and listen to what he has to say. When you have heard all you wish, thank him. Begin to walk back toward the gateway. Stay focused on your breath as you take on last look at the beautiful world beneath the waves. Walk through the gateway and see it close. Take several deep breaths and then open your eyes slowly. Write down what you learned in your journal. Close your circle. Posted on June 14, 2011 by ladyoftheabyssPosted in Meditation, The ElementsTagged Altar, Breathing, Candle, Health, Incense, Meditation, Shopping, water.